If you run a small business, you may have accounts on Twitter, Facebook, LinkedIn, and other social networks. If you haven’t, you’ve probably been told many times that you should have. Why? I bet you’ve been told that, with millions of people in these networks, it’s a good place to market your business. It is, but maybe not in the way you’ve been led to expect. When these social networks started, people joined to network socially. Then people who spotted the opportunity joined just to market their businesses, but nobody—NOBODY—has ever joined a social network to be sold to. What this means is that there are thousands of small business owners on Twitter lurking anonymously behind their logo and business name and struggling to get results—because why would anyone follow a business account when nobody wants to be sold to? There are people auto-posting their own blog links in multiple LinkedIn Groups under the disguise of discussions and displaying desperation by “liking” their own submissions—with the result that members are flagging them as inappropriate because nobody wants to be sold to. Facebook is littered with unloved and unseen business pages as (even if they’ve liked them out of politeness) the posts are invisible because nobody wants to be sold to. The problem is that everyone is using the term “social media marketing” without fully understanding what it means. Social media marketing is an art and a science used to great effect by big brands and specialist agencies that use complex tools and algorithms to decide where to place adverts and do their marketing on social networks. It is not something that small businesses can dip into on their own. This begs the question: If you run a small business; can you use social networks for marketing? The answer is an emphatic “Yes,” but you need to adopt different strategies. Instead of social media marketing, concentrate on becoming an expert social networker. I’m guessing that as a small business owner you are already pretty good at face-to-face networking so you already know the basics. You wouldn’t turn up at a networking meeting with a bag on your head with a business card stuck to it, so don’t do that in social networks. You wouldn’t burst into a room and blurt out a sales pitch—or worse, send a recording of your sales pitch—to be broadcast at scheduled intervals at several meetings at once. Don’t do that in social networks. You wouldn’t ignore people in the room who spoke to you until you found time to reply to them a couple of days later, so don’t do that in social networks. Grab Your Tools and Get Networking! Speaking as someone whose business has tripled since I started using social networking, there are some excellent tools that make it easy for us to hear what are our prospects are talking about, know when we’re being talked about, make it easy to respond and generally allow us to do everything online that we can do in a room full of people. My advice is to forget social media marketing and use the tools that make it easy to be great at social networking. Talk about the things that let people get to know you as a person and when they get to know you and like you, then they’ll be interested in what you do. 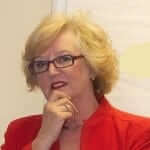 Ann Hawkins is a business mentor, founder of The Inspired Group, and presenter of The Business Hub Radio Show. If you’d like to talk to Ann about how to take your business from OK to Excellent call her on 07711 705038 or connect socially with the links below.